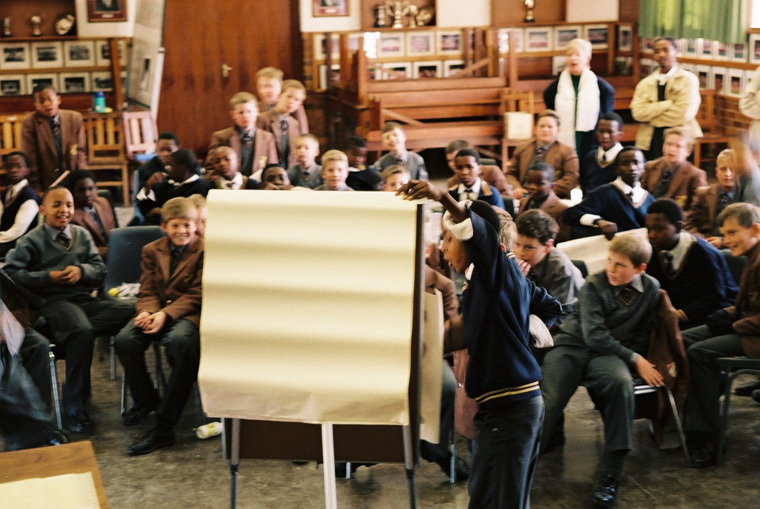 Over the past few months, we have been consolidating our AVP (Alternatives to Violence Project) programme in South Africa, preparing for the next stage of its growth. 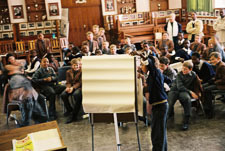 With around ten workshops each month in 2003 so far, and over a hundred facilitators, this part of my host organisation's work continues to steadily increase in scale. The demand is huge for such work, wherever we go. Many places in South Africa, not just in townships but workplaces and other communities, people struggle with verbal and physical violence. Exploring in a group positive ways of handling ourselves and others, and seeing that alternatives are available, affects participants profoundly. People sometimes contact us after hearing about workshops from other participants. Our facilitators often show the effects of the programme by visibly transforming their lives, which their communities see and take note of. Its more difficult to arrange strong commitment within schools and communities, a venue and catering, and some way of funding the work. The school I have taken responsibility for is about an hour out from Johannesburg, in a remarkable township called Orange Farm. This is newer but generally poorer than Soweto, and has high levels of endemic violence. The school itself has no working phone and few facilities, so organising things from a distance is difficult. Tomorrow I need to drive there to finalise catering for two workshops over the weekend, deliver certificates from the last workshops, and meet with my team of facilitators. 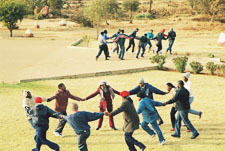 First part of a fun and energetic schools exchange my host organisation set up between a black school in Soweto township, and an affluent, mainly white, school in the northern suburbs of Johannesburg. We also need some equipment for each workshop - paper, handouts, forms, pens etc. which need to be made ready, and ways of recording participants and facilitator details. To this end, we are streamlining some of the preparation processes using generic 'workshop packs' that are made ready in batches, and entering information into a database to produce certificates and other reports we need. In a sense this is 'industrialising' to scale up our capacity, making tasks more efficient without losing the flexibility and human aspect they require. Another aspect of this is making sure all our team of facilitators get opportunities to do workshops and develop their skills, while maintaining a good balance of facilitators for each particular workshop. This is something that takes a lot of work before each workshop, so we are working on better ways of handling this too, using information about what experience and skills each facilitator has, and has indicated they would like to develop, as well as their availability and transport requirements. We've recently had some productive workshops with facilitators about general facilitator values, and what is needed to empower more of our facilitators to be able to set up and run workshops. Some of our facilitators, particularly in the townships, were feeling out of the loop about coming workshops, and were available and eager to do more workshops than we could set up. We realised that the time constraints of our core team, who are mainly volunteers with other work commitments, could begin to hold the growth of AVP back. Part of the impetus behind streamlining and simplifying processes came from this feedback, and therefore aimed to help more facilitators be able to set up and run workshops themselves. At the same time, such processes need aspects of quality assurance and accountability. So the internal changes underway are the results of growth, and will help us expand our capacity, and our work, even more. Its an exciting time! whether those barriers are of race, language, history or fear.